In the early 1960s Geoffrey Bibby and the Danish archaeologists from Moesgaard Museum working in Bahrain were able to get permission to visit the Eastern Province of Saudi Arabia on the invitation of workers from Aramco. In 1968 they got permission to conduct some more extensive survey and excavation on the exciting sites that they had discovered during their preliminary explorations. Following in their footsteps, the Friendship Tour team crossed the causeway into Saudi Arabia with the early morning commuter traffic and headed to the island of Tarut, just north of Dammam. Tarut is joined to the mainland by a short causeway and we were able to admire the flamingos feeding in the shallows. It is a very important site for the region with long connections through history and prehistory to Bahrain. Tarut was closely linked both in terms of population and trading activities with Bahrain throughout the last few thousand years. We know this from many historical accounts, but the enormous antiquity of these links was demonstrated by the Danish archaeologists from Moesgaard Museum, when they found Dilmun pottery in their excavations below Tarut Fort. Ali and his initial crew - journalist Taha Alawi and photographers Ammar Hammad and Haider Rafiey - have driven through the Saudi desert and are now in Jordan where they have been joined by TV presenter Maria Ramos and radio personality David Bloomer. Asked if he could describe how he felt after the initial leg, during which he drove for nearly two days, Ali replied: "Exhausted!" The Sakhir-to-Silverstone tour was earlier flagged off in Bahrain, with Ali driving across the 25-km causeway from Bahrain to Saudi Arabia in the early hours of Friday. 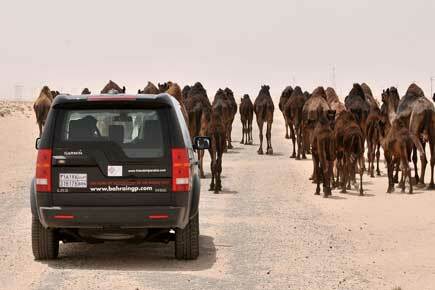 For more pictures of the drive through Saudi Arabia, view the Gallery section of this site.